I want to tell you a story about transhumance. OK! OK, I can almost hear you saying, "Trans what? What humans?" So, what is transhumance? Let me tell you an anecdote to explain it. When I first went out to Iran with the British Council, we new recruits were told we would be shown a film called Grass. This was the early 1970s, the time of hippies and drugs so we assumed we going to be warned against the perils of marijuana. How wrong we were. In fact, it was a documentary, made in 1925, about the nomadic Bakhtiari tribe undertaking an arduous journey, crossing fast flowing rivers, clambering up precipitous mountains, moving their sheep from winter lowland to summer highland pastures. That is transhumance; moving flocks of animals with the seasons from one place to another. And now, I imagine you are thinking, "1970. Transhumance. Iranian nomads! What on earth has all this got to do with Portugal? And why are you showing me a photo of a prehistoric hut?" Read on to find out. For the rest of the story click here. A friend had told me about a village with only one inhabitant. It was high in the Serra de Peneda mountains, a place that in the past must have been pretty inaccessible at any season and until recently can have had no road, just drovers' tracks. 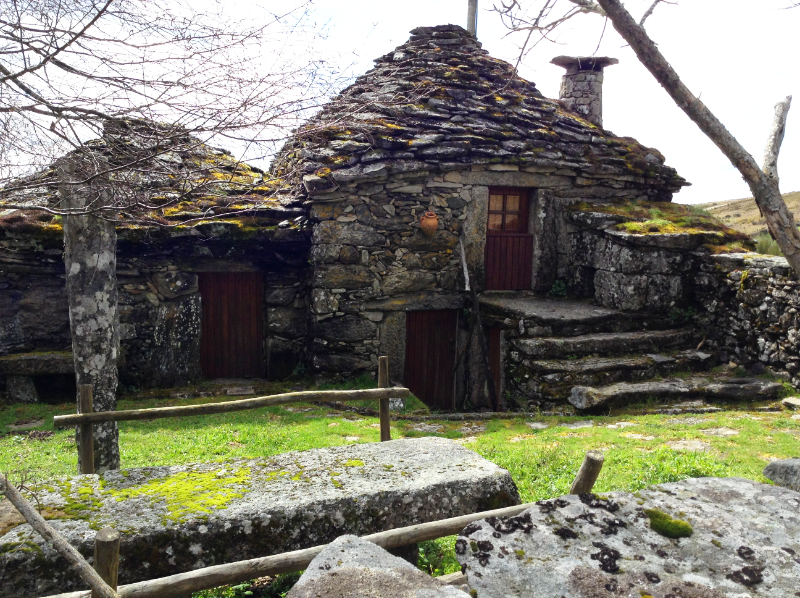 This isolated village, called Santo António de Val de Poldros, is still off the beaten track today and it really does have only one permanent inhabitant, Fernando Gonçalves. I wanted to see it and find out why it was so abandoned. To start with, I had trouble actually finding the village. I didn't have the full name, just Val de Poldros, which wasn't in my road atlas nor on my phone app so, knowing it was somewhere in the very far north, I turned off the main road between Monção and Melgaço towards a place called Poldras. Yes, I'm well aware that there isn't much logic in going to a place whose name was similar, though not identical, to one part of the name I was looking for but can you come up with a better idea? I called into a little café for a toasted sandwich and coffee and, while eating, asked the landlady if she knew where the village was. 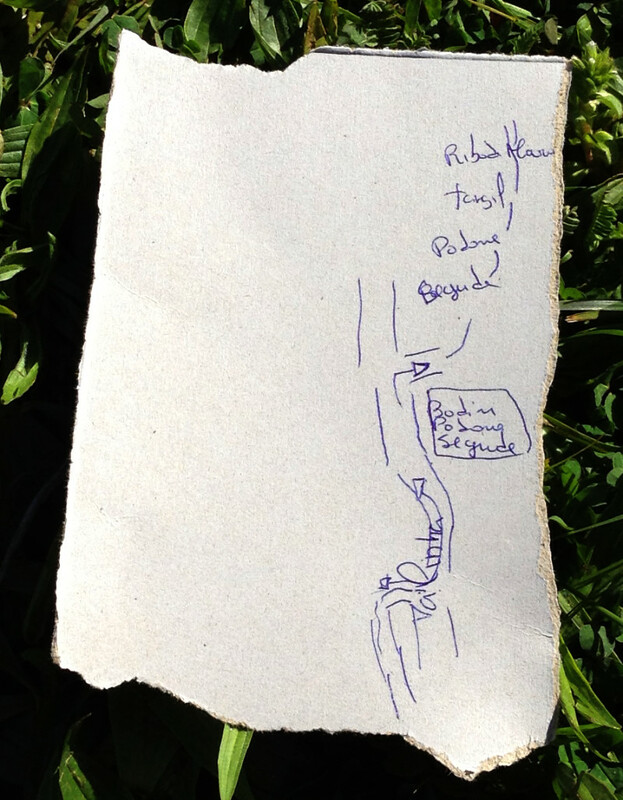 I asked her for directions and after "turn left", "straight on" "you'll see a church..." and so on she decided to draw me a map on a piece of torn card. Believe it or not, the sketch may not look much but it was perfect. Just as she told us, we turned off the main road at Valinho and drove through villages with surprisingly large houses, one with a 1950s Ford Prefect in what looked like perfect condition parked on the drive; a sign for an agricultural fair ground; and, surprisingly for a village on a side road, a car dealership with Mercedes and Audi cars. I reflected that this is, after all, the vinho verde region and there must be more money about than I had imagined. Eventually, though we passed beyond the villages and began to climb. Up, up, yet further up, round hairpin bends to the brows of hills, over which each time we thought, "The village must be here." But it seemed as though it never was. "How on earth can anywhere be called 'val' – valley – up here on what is clearly a mountain?" I asked myself as we climbed higher and higher. 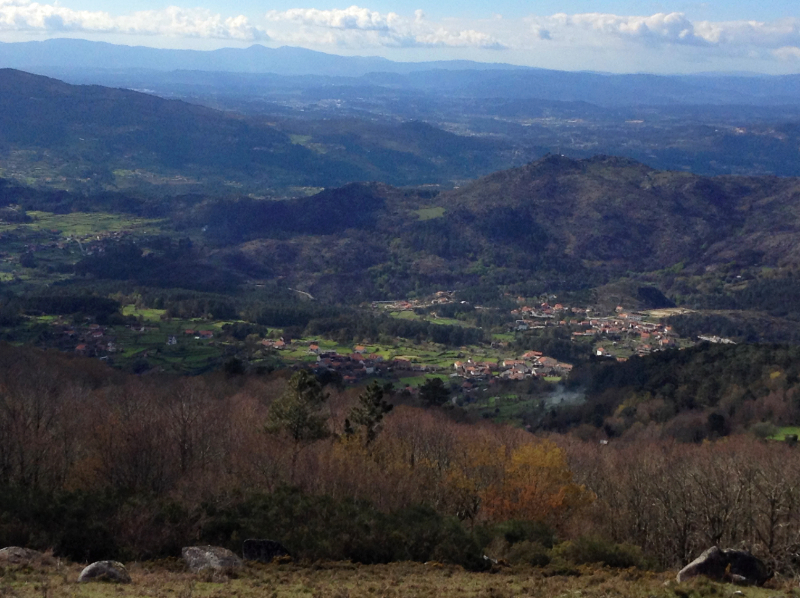 The views were stupendous, breath-taking, across fertile valleys to the Minho and beyond. Valley and hill succeeded valley and hill over the border and way into Spanish Galicia. At last we did drive over the brow of a hill to see, in a dip before the next peak, a scattered hamlet of newish houses amongst a cluster of stone dwellings, some round, some square, all small, with low doors and roofs. Most were made venerable with moss and lichen. 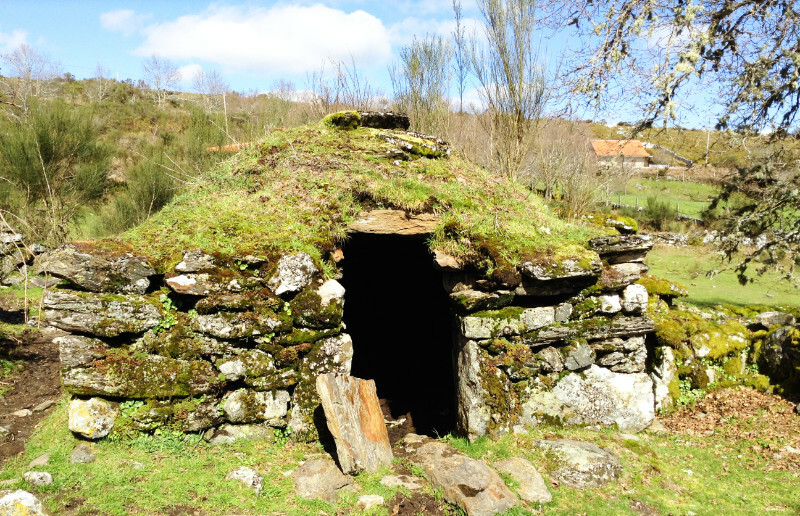 Dotted about northern Portugal are places called citânias, ancient settlements, with circles of stones, once the walls of houses, which were inhabited by Celts, who disappeared from the area in Roman times. Up here, though, it looked as if the Celts had never left. Even though not prehistoric, it is said that some of these tiny granite buildings have been there for hundreds of years. Clearly, these brandas - temporary dwellings - were no longer lived in but as recently as thirty or forty years ago, people still inhabited them in the summer. Shepherds and cowherds brought their flocks up from the lowlands, where the grass dried and burned up in the heat, and stayed in the huts from May to September, returning as the weather cooled to their real homes in the lowland valleys. Transhumance used to be a way of life for herdsmen here in northern Portugal. 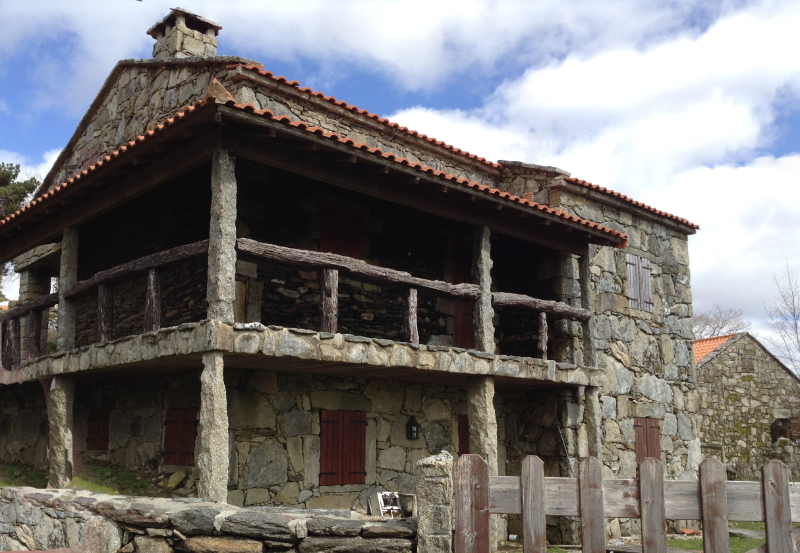 In a funny way it still is, for people have built holiday homes in Santo António de Val de Poldros. 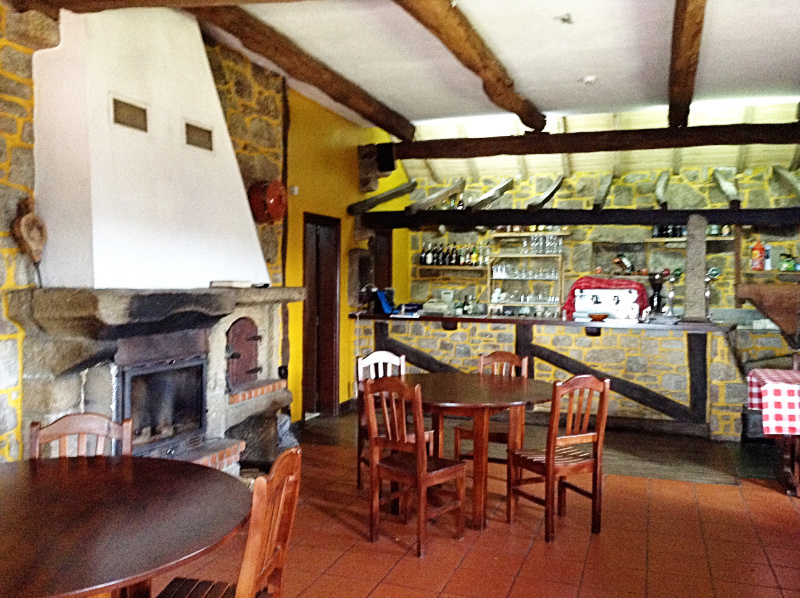 Some are locals but others come from quite far away: Barcelos and Porto. They come up to the high lands for their holidays in the summer and for the the feast of St Anthony, when there is a big fair and party, and in the winter they go back to their homes in the lowlands. Modern day transhumance! The landlady of the café was right in as much as the properties are owned, but wrong in thinking there were other permanent villagers. Lonesome Fernando is the only real inhabitant. Why do I call Fernando Gonçalves 'Lonesome Fernando'? Well, I am reminded of Lonesome George, the tortoise on Pinta island in the Galapagos. He was one of a kind, doomed never to have a companion. It's hard to imagine Sr. Fernando finding someone else sufficiently eccentric as to want to share the solitude of the high mountains: he too is one of a kind and alone. Yet he isn't in fact alone all the time, for bizarrely, in this remote place, one where you have to make a considerable effort to get there, Sr. Fernando runs a restaurant and he is optimistic of a tourist renaissance in the village. He thinks that governments corral people into towns to save on transport and keep an eye on their doings. He also thinks that eventually some people will revolt and that that will be his opportunity, the bright future for his village. The dishes he prepares depend very much on what is available. Soup may be made out of local plants growing wild in the hills; the meat may be goat or lamb depending on the animals around. The recipes are traditional, peasant ones. Many days during the year Sr. Fernando will have no guests, especially in winter when it snows – yes it can be really cold in Santo António de Val de Poldros. (In fact three days after we left the village in mid-April, snow fell on the highest peaks of the Peneda Mountains.) 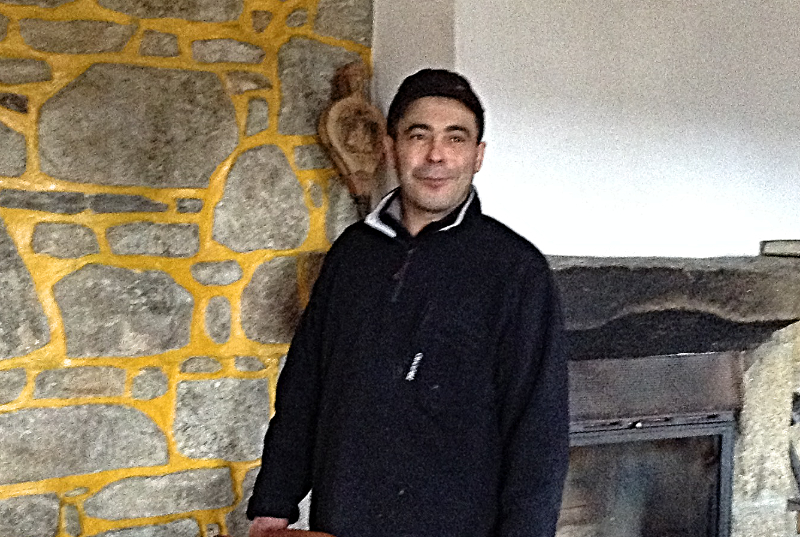 On other days, word of mouth brings people from Galicia, local towns and even from overseas. There have been Japanese, French, Americans, Ukrainians... did I hear that aright? Ukrainians? Oh yes and the odd English person too - and that's not just me. Sr. Fernando laments the difficulty of getting anyone to come up here to help cook or serve. I can't say I'm surprised. It's a heck of a journey to have to make every day. What, though, if you really, really want work? Then maybe you're prepared to go the extra mile – literally! We met the present chef's assistant, a man who lived in a townlet way down the hill but came from very far away. Can you think of the least likely place in the world for someone to come from? How about the island of São Tomé – the place I knew of, when I was a child stamp collector, as part of the St Thomas and Prince islands? As day drew to a close, I was sorry to leave this extraordinary place. Who would have thought, in today's Europe, to find the vestiges of a recent semi-nomadic lifestyle; a man who lives the life of his choice, totally alone in a wilderness of granite and grass; a restaurant where there are no local clients; and a cook from a tropical island? Transhumance was common in t5he Welsh and SDcottish Highlands. The Gellic word for a temporary summer dwelling is a shieling, in Welsh Hafod. I've a picture of a very primitive shelter in North Wales but I don't know how to include it in the post. I also once found a domed stone hut, just like the ancient Irish and Scottish monastic cells, but probably much more recent miles from anywhere in the loch-strewn of the Hebridean island of Lewis, a much more barren place than that you depict. As for absurdly remote businesses, Achin's Bookshop in Inverkircaig takes some beating - their net profit is better than I've ever achieved and the turnover, though a lot smaller than ours is scarcely credible. I think that the Scottish educational system keeps them afloat with a big contract. Interesting! Similar places often find similar solutions to the same problem. I don't know when the people of Wales and Scotland last travelled with their animals. In the modern world it feels like a way of life long gone but apparently it was still an active way of life when I first visited Portugal, something I didn't know then but am pleased to know now. I wonder if readers from other parts of the world can also tell similar stories.